It’s surprising how easy it is to boil an egg, yet how many people get it so wrong? Probably a lot more than you think, but that’s a totally different subject. 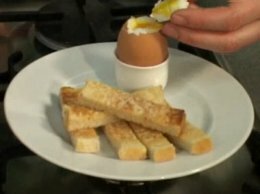 Below are quick and easy instructions on how to make the perfect boiled egg, every time, read them carefully and watch the video at the end. First, run enough cold water in the saucepan to cover your eggs by at least one centemeter, or about a half inch. If your eggs are not fully covered by water, they’ll crack because of the difference in temperature between the part of the shell exposed to the air. When the eggs are finished cooking, there are a number of different ways to serve them. You can simply serve them as-is in an egg cup with toast, or you can cook them a little firmer and use them to make egg salad sandwiches. One of my favorite things to do with boiled eggs is to dice them up and add them to a nice garden salad. However you decide to cook them, eggs make for a quick, easy and inexpensive way to add extra protein, nutrients and Omega 3 to any diet!